We provide a source of detailed solar parameters spanning the years 1914 – 1920. Although various catalogs containing information on sunspots and sunspot groups have been available for almost 150 years, the contents and conventions can vary greatly from one source to another. Thus, the availability of multiple sources is very important to assess the relative uncertainties in the identified quantities. We provide here a machine-readable version of the sunspot catalog made by M. Aguilar from 1914 to 1920. We show and explain the structure and possible errors found in this catalog. We also try to understand the specific differences of this catalog, i.e. explain the shortcomings and benefits of this catalog versus other available sources of solar information. 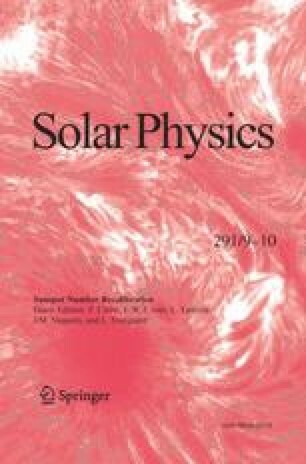 This catalog, combined with the Valencia catalog, presents a valuable source of comparison with the Royal Greenwich Observatory (RGO or GPR for Greenwich Photoheliographic Results) data, and it helps shed more light on the link between the RGO classification and the more modern classifications of sunspot groups found in the Zürich or McIntosh classifications. We also extend the work started by Carrasco et al. (Solar Phys. 290, 1445, 2015) on the mapping of Cortie types. L. Lefèvre would like to acknowledge financial support from the Belgian Solar-Terrestrial Center of Excellence (STCE: www.stce.be ). Part of this work was developed in the framework of the SOLID project (EU 7th Framework Program, SPACE collaborative projects: projects.pmodwrc.ch/solid/ ) and of the TOSCA project (ESSEM COST action ES1005 of the European Union: lpcs2e.cnrs-orleans.fr/~ddwit/TOSCA/Home.html ). This work was partially financed by FEDER-Junta de Extremadura (Research Group Grant GR15137) and from the Ministerio de Economía y Competitividad of the Spanish Government (AYA2014-57556-P). A.J.P. Aparicio thanks the Ministerio de Educación, Cultura y Deporte for the award of a FPU grant. The authors declare that they have not conflicts of interest.